Fiona Crisp is an artist known for creating installations of large-scale photographs that question the ontological presence of the photographic image. Her works are often generated by spending intensive periods of time in particular locations, past projects having involved working in the Early Christian catacombs of Rome and a Second World War underground military hospital in the Channel Islands. What unites these apparently disparate sites is that, contrary to their historic purpose that allowed access to a defined group of users, they have now been opened up as tourist sites where the boundaries between heritage, leisure and historical truth become inevitably blurred. Crisp completed a postgraduate degree at The Slade School of Fine Art, London in 1993 and since this time has exhibited both nationally and internationally, spending time working in Norway and in Rome where she held a Wingate Scholarship at The British School. In 1999/2000 she spent a period of time working in the North East of England whilst on the Berwick Gymnasium Fellowship and after many years based in London, Crisp moved to Northumberland with her partner and children in 2003. In 2006 Crisp undertook a residency based at the 18th Century landscape gardens at Stourhead, jointly commissioned by the British School at Rome and the National Trust. The residency produced images that have become key to Crisp's exploration of the 'construction' of view (in visual, political and philosophical terms) and culminated in her most recent exhibition for Matt's Gallery, Negative Capability: The Stourhead Cycle, in 2012. Other significant solo exhibitions include the major touring show Subterrania that launched at BALTIC Centre for Contemporary Art, Gateshead in July 2009 before travelling to Impressions Gallery, Bradford and finishing at Newlyn Gallery, Cornwall in April 2010. A monograph entitled Hyper Passive surveying Crisp’s work over the last 10 years was published to coincide with the show by Matt’s Gallery, London; the book includes an essay by Professor Christopher Townsend of London University and an interview with Alessandro Vincentelli, Curator of Exhibitions and Research at BALTIC. Crisp is currently an Associate Professor in Fine Art at Northumbria University where she is Course Leader for the MFA programme as well as supervising PhD students. Her practice-based research has for many years been concerned with the photographic object as an unstable and deeply equivocal phenomenon but in recent years Crisp has had a developing dialogue with fundamental scientists regarding the visualisation of concepts and data that challenge the limits of our imaginative capacity. Her current project Material Sight, funded by the Leverhulme Trust pursues these questions through collaboration with three world-leading research facilities for fundamental science. Fiona Crisp’s work is represented by Matt’s Gallery, London and is held in the collections of The Tate Gallery, The Government Art Collection, The Arts Council Collection, Worcester City Art Gallery and private collections. Installation view. Aspex Gallery, Portsmouth. Installation view. 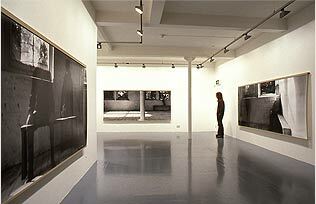 Matt's Gallery, London. 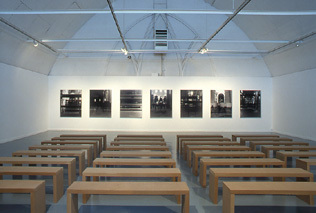 2006 Abteilung, The Greenhouse Gallery, St. Peter Port, Guernsey C.I. The Berwick Gymnasium Fellowships 1003-2005 Berwick Gymnasium Gallery, Berwick upoon Tweed. Beauty and the Beast Stourhead Landscape Gardens (NT) Wiltshire. 2105 Residency - Madstun, Norway. 2008 Nominated for the Northern Art Prize and Sovereign Art Prize. 2007/8 The Geevor Commission - Newlyn Art Gallery, Cornwall. 2007 Residency - Allenheads Contemporary Art, Northumberland. May - Nov.
International Artist in Residence Programme, Guernsey College, Guernsey C.I. Sky Arts at BALTIC – featuring Subterrania broadcast in November 2009. 2006 Vincentelli, Alessandro BALTIC Centre for Contemporary Art Library & Archive archive.balticmill.com Fiona Crisp in conversation with Alessandro Vincentelli. Currently Associate Professor, Fine Art University of Northumbria, Newcastle. 2002/3 Associate Lecturer Fine Art (photography) BA Camberwell, London. 1998-2004 Visiting lecturing at various institutions incl. Slade, Camberwell, Winchester, Coventry, Sunderland etc. Ruination: Photographs of Rome Wrigly, Richard. 2005 Responding to Rome. British artists in Rome 1995-2005 Pub. BSR. 2002 The British School at Rome, Fine Arts 2001-2002 Pub. BSR. The Government Art Collection, Worcester City Art Gallery & Private Collections.